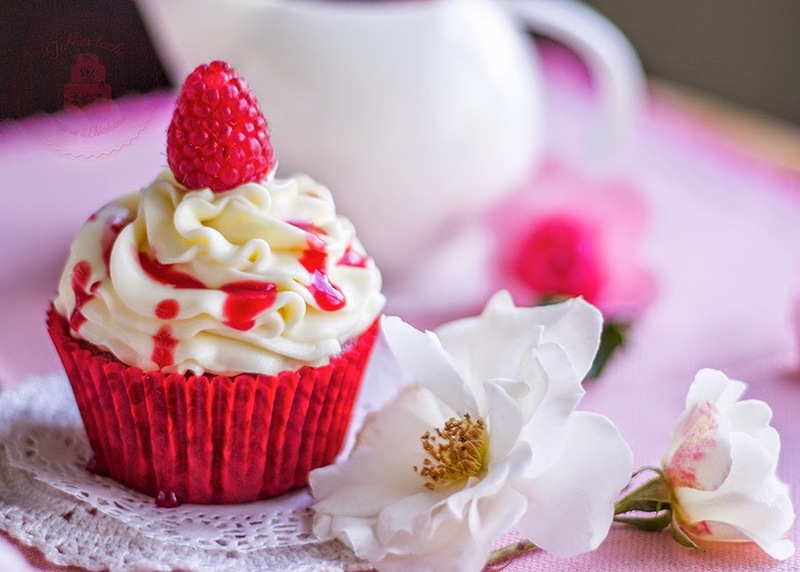 These cupcakes are made with raspberry purée, which enhances the acidity and is a perfect touch to the cream-cheese frosting. 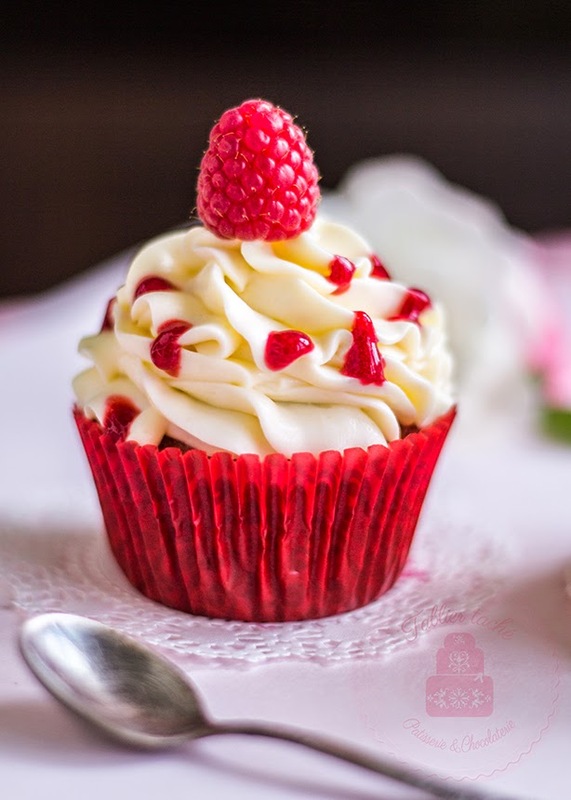 I used lemon juice in the cupcakes, instead of vinegar, because it is a perfect partner to the raspberries. 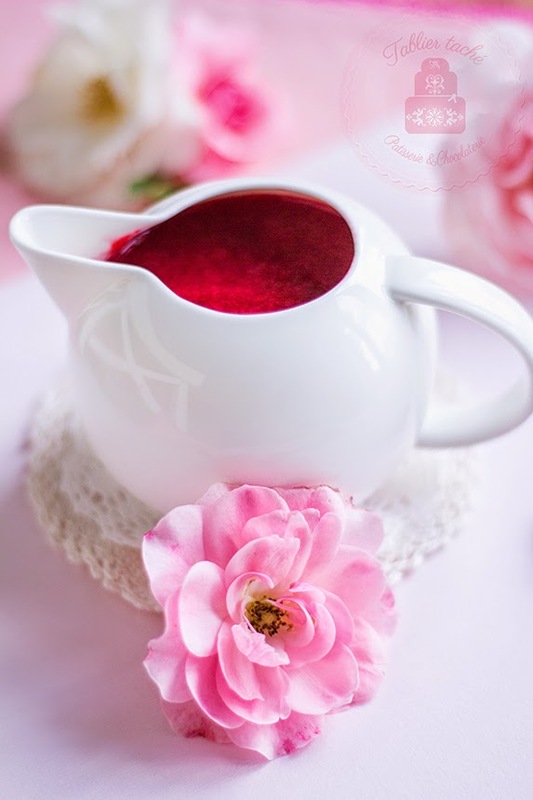 The quantity of the lemon juice is just enough, that to add an additional acidulation to the raspberry purée and to reacts with the casein in the milk. Yes, this project is not all about the delicious cupcakes, but science as well. My little one is in love with science - she has a nice science kit and always pretends that she makes experiments. Today, we decided to turn this cupcake decorating into a fun science project, that results a perfect Raspberry Red Velvet Cupcake. 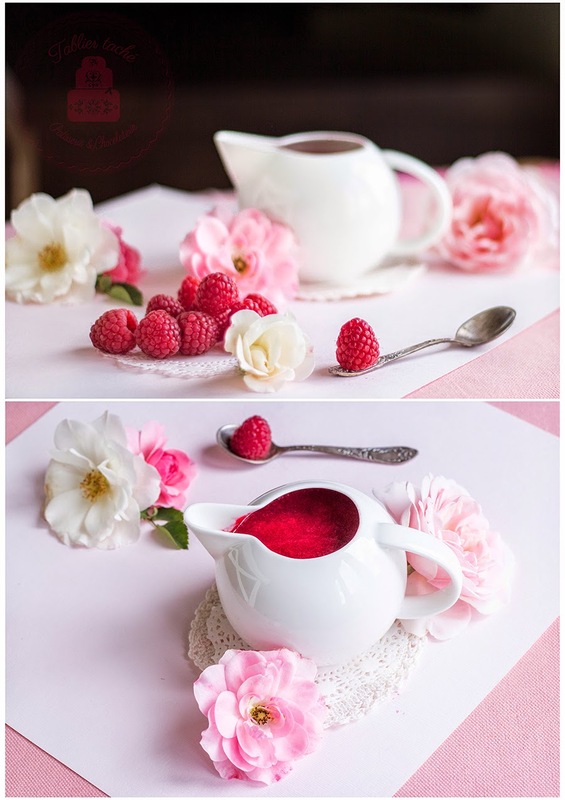 Place the raspberries in a blender. Let them stay at room temperature for an hour until slightly defrost. Bring the water and the sugar to a boil. Add the syrup and the lemon juice to the blender. Blitz to a smooth purée and pass through a sieve. Keep in the refrigerator until needed. Line a baking cupcake dish with paper cups. Preheat the oven to 180°C. Add the lemon juice to the milk. Stir and let it stay until you scale and prepare other ingredients. Do not freak out with the consistency of the milk mixture. This chemical reaction (the curdling) is intentional. The acid is enough to make casein cells meet together but not as much to cause vast separation. We are not making cheese here. In a working bowl, beat the egg, oil and raspberry purée. In a separate bowl, scale the flour and baking soda. Mix well. Add the cocoa powder and salt. Mix again. Add the milk-lemon mixture to the working bowl. Add the sugar to the liquid mixture and with a hand whisker, whisk lightly until dissolves. Add the dry ingredients in two batches. When you add the first half, start string with the whisk clock wise from the centre, following a spiral path. Each time, add more and more flour. Try to add it in small portions, avoiding lumps. Add the second half and stir in the same manner. The batter you will end up with is pretty liquid like, and this is perfectly right. Distribute the batter into the baking dish. Fill all 12 cavities equally, at least 1 cm bellow the edge of the liners. Place in the oven and bake for about 20 min. Check with a toothpick after 15 min of baking. Rotate the pan half way through baking. Let them rest in the pan for 10 min after baking and then, transfer on a wire rack to cool completely. Beat the butter until it reaches a mayonnaise consistency. Scrape down the bottom of the bowl, add the lemon juice and beat again. Add the cream cheese. Cream well, until completely homogenized. Sift in the confectioners' sugar. Add the cream in the middle of the sugar. Cream well. At least once, scrape down the bottom of the bowl. Make sure that the batter-cheese is well mixed with the sugar. Cover with wrapping foil (the foil should touch the cream) and place in the fridge for not longer than an hour. 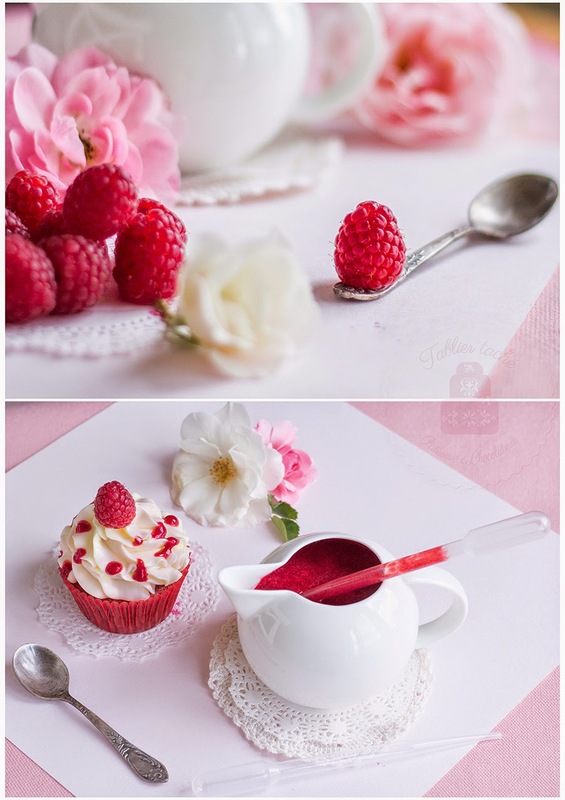 Spoon in a piping bag with a tip of your choice. 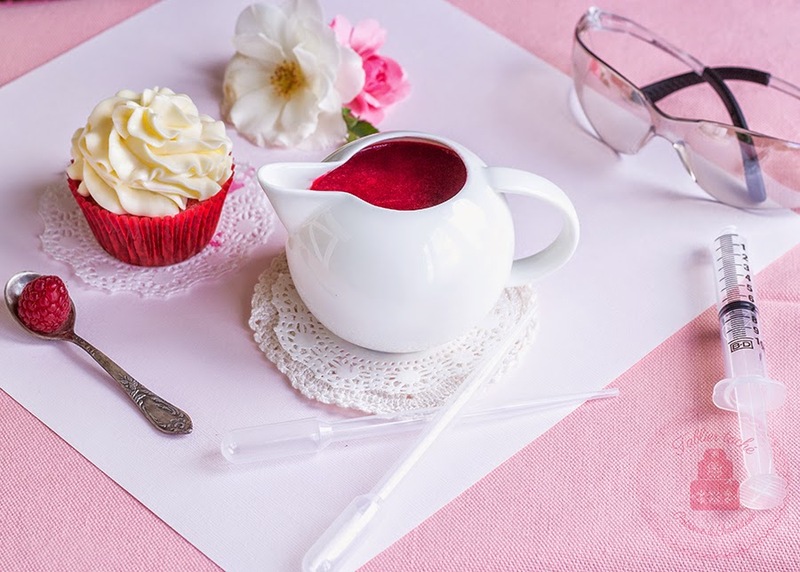 You will need the ready raspberry purée, 12 fresh raspberries, baked cupcakes, the frosting and a pipette (maybe even a safety glasses :). 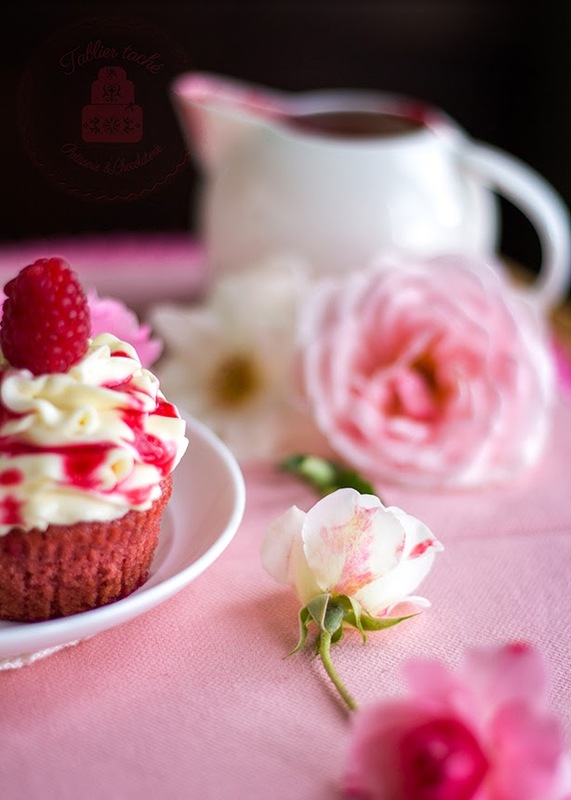 Arrange all the cupcakes on the working plate that could fit in the refrigerator. Pipe mounds or swirls (depending on the tip you are using) on each one. Place the plate in the fridge for an hour. Prepare your science lab. Have a pipette ready. Safety glasses are something my daughter thinks you need to wear. Take the cupcakes and raspberry purée out of the fridge. 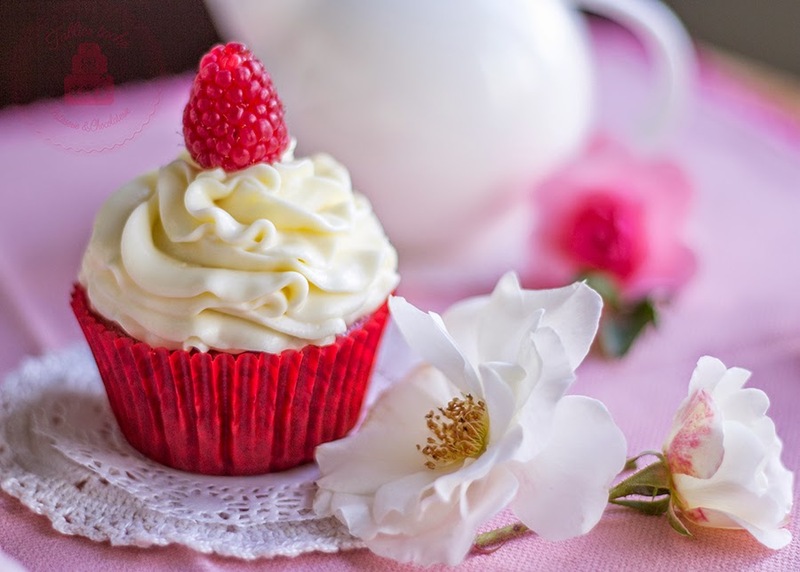 Place one raspberry upside down over the top of the frosted cupcake. Fill the pipette with enough purée and drip some of it over the frosting. 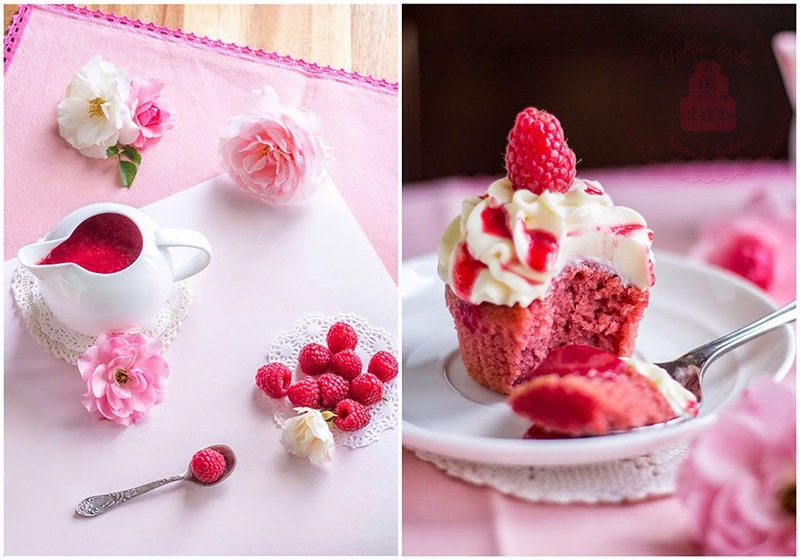 It is so much fun for the young hands to drip drops of red purée all over the white cheese cream frosting. She used one full pipette for each cupcake. 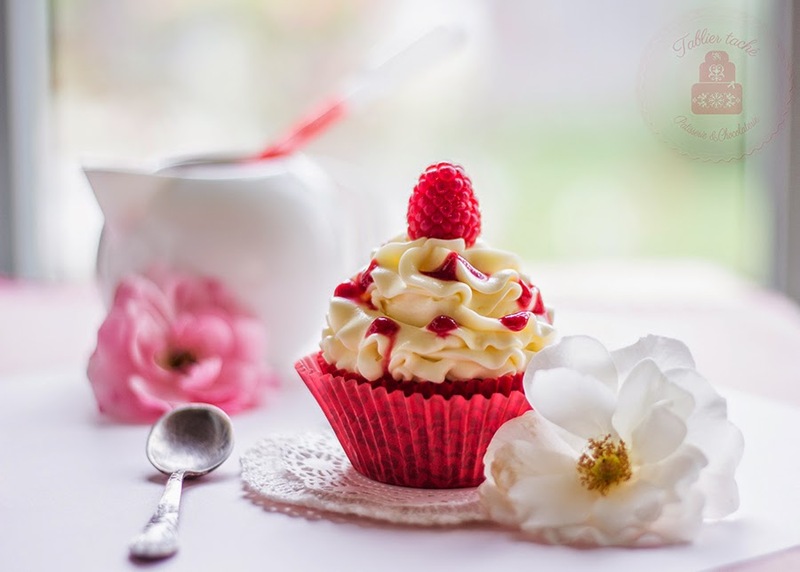 I am not sure if these cupcakes are so delicious and nicely looking because of the excitement and love Ana put in them, or because of the recipe, but they really crowned a special dinner with very close friends. Keep them refrigerated. Serve with additionally spooned raspberry pure on the serving plate. IvyNik. Simple theme. Powered by Blogger.